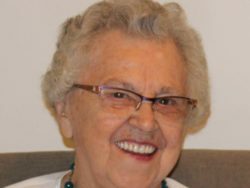 Jessie Brinks - Heritage Funeral Homes Inc.
of Listowel and formerly of Palmerston, passed away peacefully at the Stratford General Hospital on Saturday, January 12, 2019 in her 88th year. Beloved wife of John Brinks for 66 years. Dear mother of Henry and Linda Brinks of Alberta, the late Alexander Brinks (1962), Theresa and Rick Metzger of RR # 4 Listowel, and Alise Williamson of London. Cherished grandmother of Stephen and Candice Brinks of Alberta; Daniel Brinks of Brantford; David and Kirsten Brinks of Alberta; Shawn and Sarah Metzger of Listowel; Jenni and Jason Yantzi of Milverton; Michelle and Ryan Lowes of Mount Bridges; Mark Williamson and Silina Tripp of London. Much loved great grandmother of Nolan, Ethan, Graham; Nathaniel, Caleb; Adalyn, Alayna; Tyler, Lucas, Dylan; Zachary, Liam, Megan, Kayla (2017); and Graydon. Jessie is fondly remembered by family and siblings in Holland, nieces, nephews and friends. The family will receive friends at the Drayton Reformed Church, Wellington Street, Drayton on Monday, January 14, 2019 from 2 to 4 and 6 to 8 p.m. Rev. Daniel DeVries will conduct the Funeral Service in the Drayton Reformed Church on Tuesday, January 15, 2019 at 11:00 a.m.
As expressions of sympathy donations to Drayton Reformed Church would be appreciated by the family.